RPSC Head Master Recruitment 2018-2019: The officers of Rajasthan Public Service Commission (RPSC) are ready to recruit the applicants to fill up 1200 Head Master posts. For that reason, the authorities have issued RPSC Head Master Recruitment 2018-2019 Notification on 28th March 2018. But the Online Application Form submitting starts from 9th April 2018 and ends on 8th May 2018. Before going to apply for the job, aspirants must know issues about eligibility. Because by using these qualifying details only, the officers of Rajasthan Public Service Commission (RPSC) accept the application form. Therefore, contenders go down to this article and know the information about RPSC Head Master Vacancies 2018. And also check the official RPSC Head Master Openings 2018 Notification which is available in this article or the home page of the official website. Latest updates about RPSC Head Master Recruitment 2018-2019 Notification is available in this article. For that sake aspirants, we had mentioned complete details about RPSC Recruitment 2018 Notification in a detailed manner. Therefore, contenders can check this article until the end and gather complete information about RPSC Head Master 2018 Recruitment from this page. In this article, we had given the complete details about Education Qualification, Category Wise Details, Selection Process, Application Fee, Salary Details, Age Limit and Age Relaxation Details understandably. So the job seekers go down this article capture data about all these aspects. 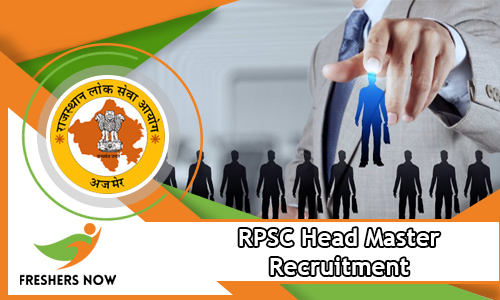 The higher authorities of Rajasthan Public Service Commission (RPSC) plan to recruit talented and willing applicants to fill up 1200 Head Master posts. For that purpose, the officers of Rajasthan Public Service Commission (RPSC) issue RPSC Head Master Recruitment 2018-2019 Notification and start the online application form from 9th April 2018. Once the online application form starts, then applicants can submit their application form through online before the due date 8th May 2018. Therefore, willing and interested applicants can check our web page or the official web portal of the Rajasthan Public Service Commission (RPSC) to know latest updates about RPSC Head Master Recruitment 2018-2019 Notification of 1200 Vacancies. Aspirants who want to apply for the Head Master posts those candidates age limit must lies between 24 Years to 40 Years. Contenders can also know details about Education Qualification. Applicants must have Bachelor Degree or Diploma with minimum marks. In the below fields, we had given complete information about Qualification details. By checking the RPSC Head Master Recruitment 2018-2019 Notification also, candidates can know all the details. As per norms of the Rajasthan Public Service Commission (RPSC), the authorities will decide the application fee. At the time of submitting the application form, participants must pay the application fee. Moreover, the authorities of Rajasthan Public Service Commission (RPSC) has mentioned all the details about the selection process and pay scale in the RPSC Head Master Recruitment 2018-2019 Notification. Aspirants must face Written Exam and Interview for getting the job in Rajasthan Public Service Commission (RPSC). After getting the job, the job searchers will take a high salary from the officers as per rules and regulations of Rajasthan Government. Therefore, contenders have any doubts about how to apply for the RPSC Head Master Recruitment 2018 through official web link of the Rajasthan Public Service Commission (RPSC) then check the below section. At last, we had provided the applying process in a steps wise manner. Contenders keep in touch with our web page or the official web link of the Rajasthan Public Service Commission (RPSC) to know current updates about this article. In this section, we had mentioned Category Wise Vacancies Details For Head Master Post. Therefore, applicants have any doubts about this section can check the official Recruitment Notification once. Moreover, contenders can check the Recruitment Notification to know the details about Application Fee. Based on the category the application fee is varied. Contenders must pass the Bachelor’s Degree with Degree or Diploma in Education from a recognized University/ Institute along with Minimum five year’s Teaching experience in any School. Aspirants also have Working knowledge of Hindi written in Devnagri Script and knowledge of Rajasthani Culture. Therefore, the minimum Age Limit is 24 Years and the Maximum Age Limit is 40 Years. As per the Reservation, the age relaxation is decided by the authorities of Rajasthan Public Service Commission (RPSC). However, the officers of Rajasthan Public Service Commission (RPSC) will select contenders by conducting two rounds of the selection procedure. As per the rules of Rajasthan Public Service Commission (RPSC), the officers will pay the PayScale Pay Matrix Level (L-14) along with Grade Pay to the selected applicants. Log on to the official web link rpsc.rajasthan.gov.in of the Rajasthan Public Service Commission (RPSC). Now, press the RPSC Head Master Recruitment 2018-2019 Notification link. You have to get the Recruitment Notification pdf file on the screen. Now, check the details mentioned on the RPSC Recruitment 2018 Notification. After that, click on the Online Application Form. Now, fill up the application form with exact information. Finally, submit the application form on or before the last date. Therefore, contenders stay tuned to our portal Freshersnow.com to know more information about RPSC Head Master Recruitment 2018-2019 as well as Syllabus, Previous Papers, Admit Card, Result, etc.